Opto 22 G4 series modules are still an excellent choice for basic industrial sensing, control, and ladder logic applications. One should never argue with the simplest and most venerable of solutions, and after over 30 years of availability in the industry, we still like this one. These simple modules offer easy sensing and switching as participants in line voltage logic circuits or low voltage control wiring circuits. Unlike control products limited to low voltage, they do not need interposing relays to participate in higher voltage logic functions, including direct switching and management of modest loads. In addition to the cost savings of direct application, the modules are offered at price points comparable to discrete solutions. 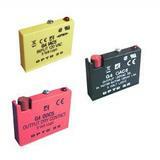 These pluggable modules are easily maintained and are backed by the famous Opto 22 lifetime warranty. While several manufacturers do offer similar modules, Opto 22 still appears to offer the most compact and versatile designs. Racks of these modules connected to a host computer can form an alternative solution to a programmable logic controller (PLC) or they can support an existing PLC design. Allied Component Works has completed a number of designs incorporating these modules in industrial control applications. We are ready to help you implement a robust and effective industrial switching and sensing solution.